Blue Chip Joint RLF is the first product of its kind which uses the most effective natural ingredients for joint comfort and health. The powerful properties of rosehip have been known for decades. Joints are dynamic structures their health and maintenance ensure horses remain in work. It will ensure a more natural trouble free flexible future for your horse. 1 bottle lasts approximately 40 days. Extract of Rosa canina, which contains a special glycoside, has shown in published scientific studies to be a powerful natural supplement for joint comfort and mobility both in humans and in horses. Rosa canina is widely acknowledged as a major breakthrough in drug-free support and maintenance of healthy, mobile joints. Hyaluronic acid is a major component of synovial fluid and is necessary to maintain the viscosity of the fluid. Synovial fluid keeps the cartilage that cushions the bone ends soft and slippery so that the bones don’t grind against each other. For maximum benefit hyaluronic acid should be given in conjunction with glucosamine to help absorption. Glucosamine is the an important and effective agent in helping to support healthy joints. Glucosamine is vital for cartilage metabolism and for the renewal of connective tissue in and around the joints. It is required for the formation of synovial fluid, the joints’ natural lubricant, and provides the building blocks needed to repair damage caused by wear and tear and the natural ageing process. Joint RLF takes advantage of the powerful synergy between glucosamine and MSM. Our organic, bio-available MSM provides the building blocks for protein, vital for tendon and ligament repair. Proteins are a key component in cartilage formation and can aid muscle recovery and promote circulation. A rich source of saponins, which help to nourish joints. Yucca has been used for decades by Native Americans to look after their horses’ joints. The yucca used in Dynamic is specially grown from a sustainable source. This is essential for the formation of cartilage and helps with bone strength. 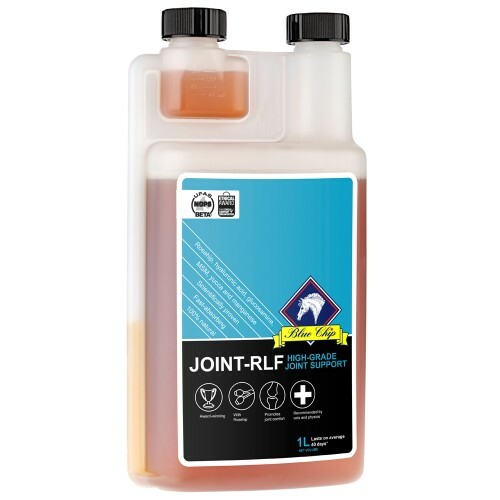 Joint RLF uses the protected form of organic manganese for maximum absorption. This important antioxidant helps to neutralise free radicals, vital for maintaining joint health and flexibility. There are currently no questions for Blue Chip Joint RLF for Horses - be the first to ask one!